It Takes a Village … Find Yours! The proverb, “It takes a village to raise a child,” is widely attributed to Africans but it reflects the experience of most humans around the world (and through the centuries) who have lived in villages. The late permaculturist Toby Hemenway noted that cities, too, have been around for eons and have served people greatly in our needs for community, security and commerce. 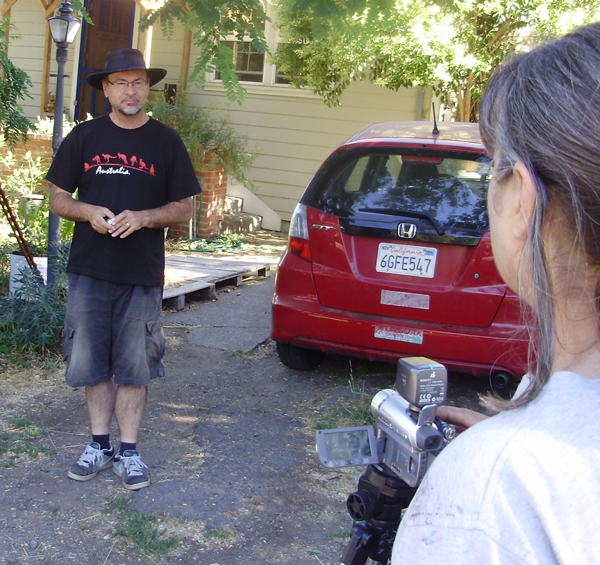 Hemenway wrote The Permaculture City in 2015 after having lived both in the off-grid countryside of southern Oregon and the city of Portland. Now David Holmgren, the co-founder of permaculture, has published his blueprint for the sustainable suburb, RetroSuburbia: The Downshifter’s Guide to a Resilient Future. 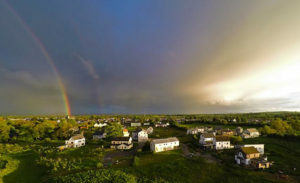 Holmgren writes that suburbs are potentially the best of both worlds, a “sweet spot” between rural and urban living. I think he’s right. Visiting Holmgren at his 2-1/2 acre homestead in central Victoria changed my life. I caught a vision of what you might call “Permie Paradise” – a family producing most of their own food and sharing the surplus with friends and neighbors doing likewise in the small Australian town of Hepburn Springs. Now, one big difference between Australia and America is scale – only 24 million Australians have to share their continent and resources. Hepburn Springs (population around 1,000) is what we Yanks would call a “village.” It is not part of sprawling, back-to-back suburbs with which city-dwelling Americans are familiar. So I think it is crucial for urban and suburban permaculturists to break our high-density regions into, well, villages. Whether these villages have 400 people or 1,000, the point is they are neighborhoods where people can focus their efforts on localizing their food system and economy. 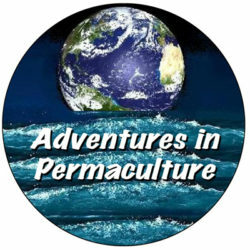 If you only read one section of The Permaculture City, read Chapter 5, “Strategies for Gardening in Community.” Hemenway applies permaculture’s “zone analysis” to the question of local food systems. Zones reflect the frequency of use, the amount of time and energy, spent in various parts of a property. Zones are usually depicted as concentric circles moving out like ripples in a pond. Zone 0 is where you live – usually a house – and Zone 1 are the grounds immediately surrounding it. 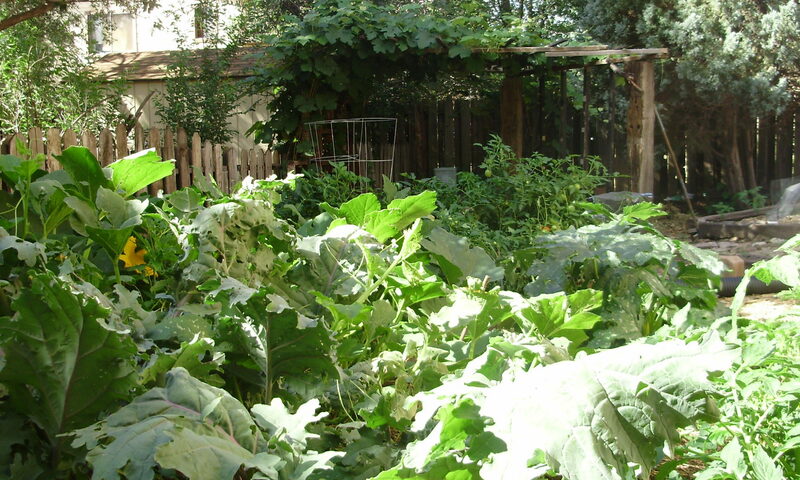 Zone 5 is farthest away and often left alone as “wilderness” in permaculture design. Hemenway asks us to map our foodsheds. Zone 1 would be food that we grow in our own gardens. Zone 2 would be community gardens or neighbors within walking/cycling distance where you could obtain food. Food you can buy from a farmer’s market or CSA (Community Supported Agriculture) schemes falls into Zone 3. The next zone represents grocery stores or other retailers that sell locally produced food. Most of us find our eyes glazing over! Our food systems are completely upside-down, with very little coming from the inner zones and most of it from global, corporate sources. In the past 20 years, I have lived in San Diego (3.4 million people), Colorado Springs (500,000) and now Humboldt Bay (88,000). All these areas are dependent on large, centralized systems to provide water, energy, food and transportation infrastructure. They all can be broken down into villages. We launched our first “Village Shift Project” in Colorado Springs in 2015. The first step was mapping all the elementary schools. Elementary school attendance areas are roughly the same in population and have already been drawn by a school district – a locally controlled governmental entity that gives intense attention to demographics. The average city map will have elementary schools identified. A map of the Colorado Springs region (El Paso County, Colorado) revealed about 125 schools – approximately 125 villages. We highlighted them and put the map on a large piece of poster board. Next, we recruited “Local Food Ambassadors.” We brought the map to farmer’s markets, environmental events and community fairs. People passionate about local food, gardening and building community were invited to plot their locations on the map with colored dots. Soon we had about 100 people plotted. The dots on the map only had numbers, but we kept track of all the names and email addresses. As the weeks progressed, clusters of dots began to form. Some parts of town had many Local Food Ambassadors (LFAs), others had few or none. Our team connected the dots – we invited people in clusters to meet for potlucks and form Village Food Councils for their neighborhoods. Soon we had like-minded folks sharing food, conducting gardening classes and trying to integrate backyard produce into the local farmer’s market. We are in the Humboldt Bay region now, trying to bring Village Shift to the communities of Eureka, Arcata, McKinleyville and Trinidad. This work includes helping edit the 2018 edition of the Local Food Guide, published by a small nonprofit called Locally Delicious. A catalog of local food assets will help LFAs and other food leaders in assessing and improving the foodshed. No studies have been conducted to determine what percentage of the food on Humboldt tables is locally produced, but the potential is much greater than in Colorado Springs, where the list of farms, farmer’s markets, CSAs and locally made products barely fills two pages. One great food asset in Humboldt is the North Coast Co-op, which boasts 13,000 members in the bay communities and operates two grocery stores (Eureka and Arcata). Almost every product made in the region can be found on the shelves and the stores even track local sales on the customer’s receipt. We have proposed a “Co-op Neighbors” project, in which members would be invited to self-organize village groups. Like Village Food Councils, Co-op Neighbors would gather for potlucks, share cooking and gardening, even arrange carpooling to stores. Our goal is to increase the access of local food in the inner zones. It’s all part of preparing for the impending impacts of climate change, food and energy shortages, and financial collapse.